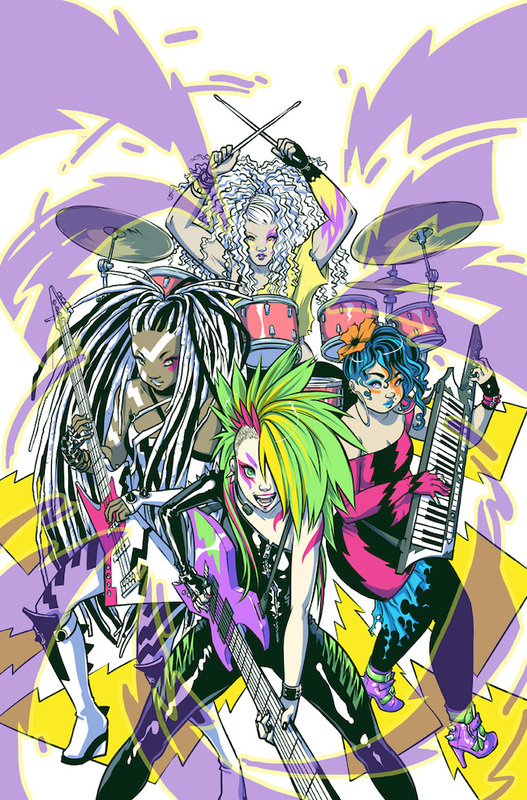 I never watched the Jem and the Holograms cartoon, but I’m definitely going to be checking out the upcoming comic, because the premise seems well-suited for the format, given its adventure and light science fiction roots. Kelly Thompson writes and Ross Campbell (Wet Moon, Teenage Mutant Ninja Turtles) draws the ongoing series about a rock group. The plan is to update the classic storylines about music and celebrity with modern attitudes. In this revamp, for example, Jerrica needs her alter ego Jem because although she’s already in the band, she has stage fright. IDW is very good with media tie-ins. In this case, there’s also a Jem and the Holograms movie planned for October starring Aubrey Peeples. Original show creator Christy Marx wasn’t mentioned in connection with this comic release, which is being handled with property owner Hasbro. There are five covers for the first issue, shipped in even ratio. This group shot is by Campbell. With four individual cover images by Amy Mebberson. The cover by Campbell for issue #2, featuring the rival band The Misfits, has also been released.